Barrett at the Ohio State 2014 spring game. Joe Thomas Barrett, IV (born January 23, 1995) is an American football quarterback for the Ohio State Buckeyes. Barrett attended S. H. Rider High School in Wichita Falls, Texas, where he was a three-sport athlete in football, basketball and track. He played as a dual-threat quarterback for the Rider Raiders football team. As a junior, he rushed for over 1,500 yards and passed for over 1,600 yards, totalling 23 touchdowns. In October of his senior season, he tore his ACL, which ended his high school career, but still managed to rush for 569 yards with seven touchdowns and pass for 784 yards and five scores prior to the injury. In spring of 2011, Barrett joined the school's track & field team, recording a personal-best time of 12.10 seconds in the 100-meter dash at the Iowa Park Relays, winning the event, while also running the second leg on the 4x400m, helping them earn a second-place finish with a time of 3:46.05 minutes. Barrett was ranked by Rivals.com as a four-star recruit and the seventh best dual-threat quarterback in his class. He committed to Ohio State University in April 2012. Barrett redshirted as a freshman at Ohio State in 2013. 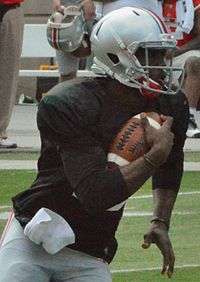 Barrett was expected to be the backup quarterback to Braxton Miller in 2014, however he became the starter after Miller was forced to miss the season due to injury. On November 29, during the OSU-Michigan matchup, J.T. Barrett went down with what was later determined to be a broken ankle early in the fourth quarter. The injury happened on a run play, with OSU leading 28–21, after Barrett had thrown for 176 yards and a touchdown while also rushing for 89 yards and two scores. OSU went on to win the game with Cardale Jones at quarterback. Barrett was cited in the weeks before the injury as a potential Heisman contender but ended up finishing fifth in the voting. His injury prevented him from returning during the 2014 season, but he had successful surgery having a plate placed in his ankle and is expected to be available in a limited capacity for spring practice. Barrett has been named the Big Ten Conference Offensive Player of the Week six times throughout his career. ↑ Andy Newberry (2013-02-06). "Barrett has a head start at Ohio State". Timesrecordnews.com. Retrieved 2015-01-22. ↑ "Iowa Park Relays- Results (FAT)". Tx.milesplit.com. 2011-03-31. Retrieved 2015-01-22. ↑ "Rivals.com". Sports.yahoo.com. Retrieved 2015-01-22. ↑ Sayles, Damon. "J.T. Barrett commits to Ohio State". Insider.espn.go.com. Retrieved 2015-01-22. ↑ "College football recruiting 2013: Ohio State picks up dual-threat QB J.T. Barrett". Sportingnews.com. 2012-05-15. Retrieved 2015-01-22. ↑ Kadar, Dan (2014-08-19). "Ohio State likely to replace Braxton Miller with freshman J.T. Barrett". Ohio.com. Retrieved 2015-01-22. ↑ "Ohio State backup QB J.T. Barrett finds himself in spotlight". Nfl.com. 2014-08-19. Retrieved 2015-01-22. ↑ Marvin Fong, The Plain Dealer (2014-11-29). "Ohio State QB J.T. Barrett's record-breaking, Heisman-chasing, dream-season ends on crutches". cleveland.com. Retrieved 2015-01-22. ↑ "J.T. Barrett of Ohio State Buckeyes carted off with right leg injury – ESPN". Espn.go.com. 2014-11-29. Retrieved 2015-01-22. ↑ "Ohio State quarterback J.T. Barrett should be ready, but limited, for spring football after ankle surgery Sunday". cleveland.com. 2014-11-30. Retrieved 2015-01-22. ↑ "2016 Big Ten Individual Award Winners" (PDF). www.grfx.cstv.com. Big Ten Conference. November 30, 2016. Retrieved December 1, 2016. ↑ "J. T. Barrett". www.sports-reference.com. USA TODAY Sports Digital Properties. Retrieved December 1, 2014.